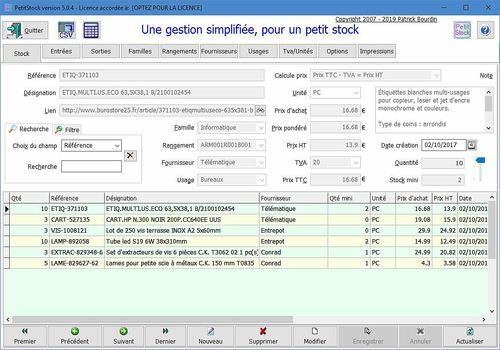 With the Petitstock software, stock management becomes easy and accessible to everyone. This software draws its power from its features that are simple and advanced enough to satisfy professionals with Firebird embled as a database. With good knowledge, it is possible to network the database, documentation is available with the application. Despite its simplicity you can filter the data to print them or export them in CSV format as a report of the results. An application allows you to import data from CSV files. Each unique reference has its minimum stock and its own way of calculating prices. To find information, a progressive search facilitates the work. It is possible with a minimum of computer knowledge to translate all the software and print labels into a language of your choice or simply to modify them at your convenience. The use of a barcode reader is included in the options to manage inputs or outputs. The prints can be modified. If you like simple and efficient things, this software is made for you.